Wade Moody and the Flo-Pro team had been chasing points all year long and they have traveled from the East Coast to the West Coast setting the NHRDA Pro Stock world on fire as they laid down the best numbers the NHRDA has ever seen in Pro Stock. Moody came into the World Finals needing to go two rounds further than Gage Makinen to clinch the MBRP Diesel Drag Racing Series National Championship. Moody was able to tighten that up to only one round as he set a new NHRDA Pro Stock record on Friday night to gain the extra 20 points. 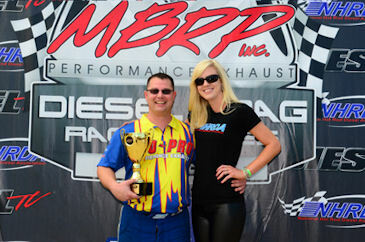 Moody then went on to win the NHRDA World Championship and wrapping up the MBRP Diesel Drag Racing Series National Championship.